If they keep this up, I’m going to run out of Australian puns very quickly. At Seoul we have what might be considered an unconventional partnership in Korean racing terms of a female trainer and female jockey – Lee Shin Young and Kim Hae Sun – being the in-form pairing, down at Busan it’s the foreigners. Specifically the Australian combination of trainer Peter Wolsley and jockey Nathan Stanley. Having won the Busan Owners’ Cup for Wolsley in his very first ride in Korea, Stanley took his win tally to six today as he combined with Wolsley to land two wins, two second places and a third. On a phenomenal – not to mention lucrative – day for the jockey, he also grabbed another second place. The wins were not unexpected. The first of them came in race 7 as Ghost Whisper (Gotham City-Emmy’s Lullaby) justified his hot favourite status to cruise home by nine lengths. The grey Ghost Whisper is owned by Jeju Island’s Pegasus Stables which, with its foreign management made for an all foreign success. A race later and the double was complete as three-year old colt Perfect Jilju (Paradise Creek-Field Bouquet) hacked up for his third consecutive victory. Despite having the favourite in the feature race, the Australian pair couldn’t quite pull off a memorable treble as 5/1 Full Forest (Full Mandate-Gazella Forest) just got the better of Mighty Hero (Buddha-Pretty Pretty) to win by a length. That second place added to an earlier runner-up finish on Tiare (Ft. Stockton-Misty Cee) in race 2 and a third on filly Always Owner (Ft. Stockton-Cozzie Maxine). 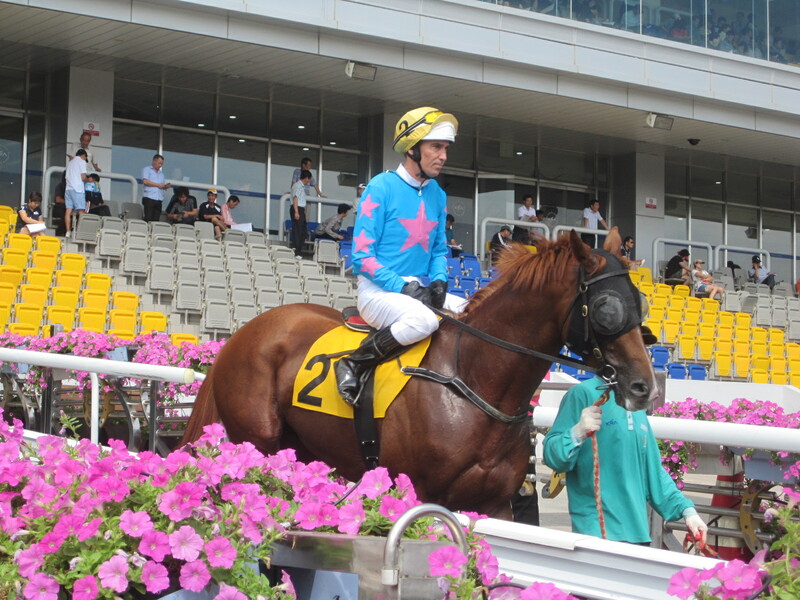 Stanley also picked up a second place finish in race 9 on Saetbyeol (Yankee Gentleman-Tom’s Kid) for trainer Lim Keum Man. Six rides, two wins, three seconds and one thirds. Almost Uchida-esque. It’s Minister’s Cup weekend! 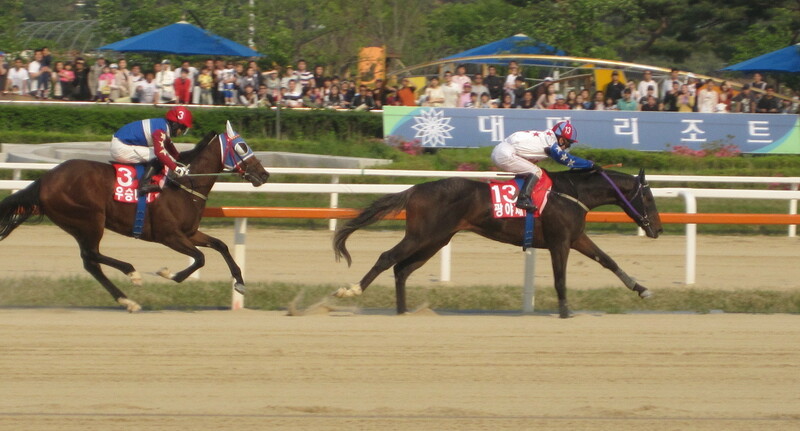 The 2010 Korean Triple Crown series comes to an end at Seoul Race Park on Sunday afternoon. However, that is just the main event of a busy weekend of racing on the peninsula which includes a rare Saturday Stakes race at Seoul in the shape of the Singapore Turf Club Cup. Let’s get the jokes out-of-the-way first. The final leg of the Korean Triple Crown is the Minister’s Cup. And the Minister in question is the Minister of FAFF – that’s Forestry, Agriculture, Fisheries and Farming. But there’s no faffing about in what is set to be a cracking finale to the Classic series. All three Classic winners so far this season will be there. KRA Cup Mile winner Soseuldaemun will take on Derby winner Gwangyajeil and Oaks winner Useung Touch. However, they are far from the only contenders in a high quality line-up that will race over ten furlongs at Seoul Race Park on Sunday afternoon. An improver who should relish going up to 2000M. Can be prone to bad behaviour, he threw his jockey and had to be scratched on his last but one start. One of two fillies in the field, she was second to the other one, Useung Touch, in the Korean Oaks in August. There’s no good reason why she should be able to reverse that finish here, but she could be involved at the business end. That regular rider Jo Sung Gon is staying in Busan may be a clue though. Getting better as the distances increase, he’s won back to back Class 2 races at 1800 and 1900 metres. He’ll have his supporters. Another late bloomer he’s won his past two races at 1700 metres. He’s not beaten very much so far but any Moon Se young ridden horse is difficult to rule out. Since finishing third in the Korean Derby behind Gwangyajeil and Useung Touch, he’s developed a severe case of second-itis of late, finishing as runner-up in his last three starts. A very capable colt but he’ll need to find something to win here. Ran second to Dongseo Jeongbeol last time out bringing to an end a series of four straight wins. Although it proved he was capable of going round two turns he’ll have to find plenty to be competitive here. He briefly became the most expensive two-year old in Korean history when he went through the sales ring early last year. He’s struggled to live up to that billing but has developed into a solid performer and arrives here on the back of two straight wins at class 2. His best may be yet to come and this could be his time. The surprise winner of the KRA Cup Mile showed up to the Derby in poor shape and was duly well beaten. He’s only run once since, putting in an improved performance in the Gyeongnam Do-Min Ilbo in July. Very talented but a close look at him in the parade ring will be required if he is to be bettable. Second in the Derby and then the easy winner of the Oaks, this filly is all class. If she’s at her best, she has a very very good chance. A late addition to the field after his last gasp win in the Ilgan Sports Cup just two weeks ago. He finished very quickly that day and should benefit from the extra distance. Could prove a handful. Unpredictible. A good winner last time out over a competitive class 2 field but he’ll be an outsider here. Champion two-year old last year, he’s had a mixed campaign as a three-year old. He is, however, one of very few of this year’s crop to have already qualified for class 1 racing. He had a tough introduction to that level last month but was arguably facing tougher all round competition than he has here. Should be in the hunt at the end. The Derby winner. And the likely favourite. He’s only run once since that win in May when he battled gamely through a monsoon downpour to win a class 2 race back in early July. But three months on, what kind of shape will he be in. Absolutely fine say the reports but he’s by no means a sure thing. Brother of 2008 Derby winner Ebony Storm, he’d been something of a disappointment before pulling off a surprise win in the Gold Circle Trophy at Busan four weeks ago to punch his ticket here. 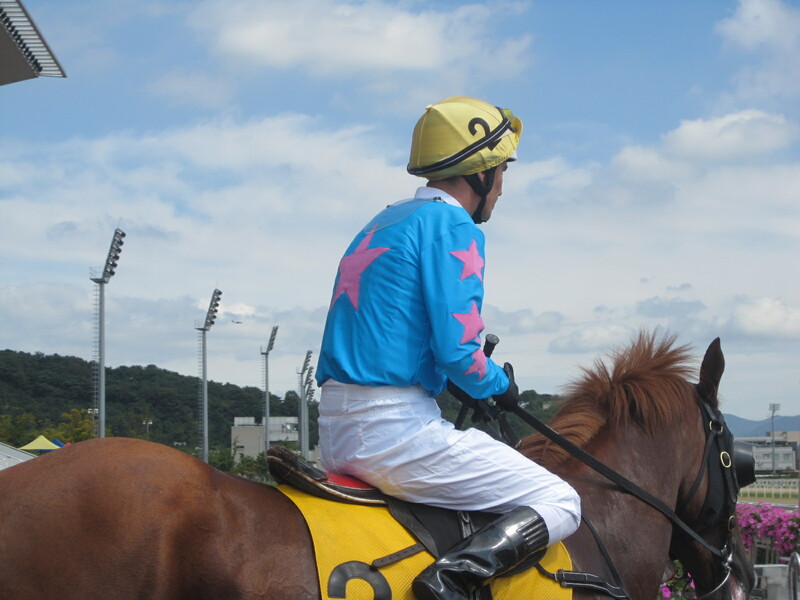 Akane Yamamoto rode him that day and the Japanese jockey will be making her Seoul debut here. Will we have a fourth name among the Classic winners this year? We’ll find out very soon. Not Just a G’Day – It’s a Great Day For Nathan Stanley! Nathan Stanley kept up his remarkable start to his spell at Busan this afternoon by taking another feature race and doubling his win tally. The Australian jockey has now won on four of his sixteen mounts so far at the track including a Stakes race and now, a Class 1. The first race was very much an Australian triumph as he partnered with trainer Peter Wolsley, for whom Stanley won the Owners’ Trophy a fortnight ago on Khaosan, to bring home debut-making colt Hanbaek Finale (Giacomo-Power Pack) by four lengths. It got better later. This time, riding for the other foreign trainer, American Joe Murphy, Stanley produced a last-to-first run on 12/1 shot Deep Desire (Jump Start-Bayou Blues) to win the afternoon’s feature race. Stanley wasn’t done yet. In the finale, he was a close second on Sagyejeol Wangja (Exploit-Thought), to winner B.B. Chant (War Chant-Bravo Bravo). B.B. Chant was ridden by Akane Yamamoto, meaning that both foreign trainers and both foreign jockeys scored winners. Nathan Stanley has big boots to fill as he replaced Toshio Uchida, a man with almost legendary status among Korean punters. He couldn’t have had a better start though. Two of his winners have come from Peter Wolsley and now one from Joe Murphy. If he keeps this win-rate up, the local trainers won’t be able to ignore him for long. The owners won’t let them. For Joe Murphy, it was also a milestone win. It was his second feature race win and came on the weekend marking his first anniversary of training in Korea. In that first year, he’s had just seven winners. however, he will look at Wolsley, who also spent his first year with an unenviable string and through hard-work and perseverance has made it to the top. The quality of horses in Murphy’s stable has improved and his second year should be more fruitful than his first. Up at Seoul, the big race was the Donga Ilbo Cup and it went the way of 10/1 chance Sen Girl (Strodes Creek-Badgering Shari). The three-year old filly made up seven places in the home straight to hit the front just metres from the line and record a half-length victory over long-shot Persona. With another outsider coming third in the shape of Gyemyeongui Bit, it made for a trio payout of 1289/1. Next week it’s the big one. The Minister’s Cup, the final leg of the Korean Triple Crown is at Seoul on Sunday October 2. The KRA Cup Mile winner, the Derby winner and the Oaks winner will all be there. Three young Korean jockeys are heading overseas for two months of training. Kim Jeong Jun and Lee Gang Seo left for Australia earlier this month while Jang Chu Yul will go to the United States later this month. The three are all graduates of the 2010 class of the KRA’s Jockey Academy and have all had reasonable starts to their career. Jang especially has already become one of track’s most consistent winners. The fourth member of the graduating class, Park Jong Hyun, was sidelined by injury for much of her first year and so will remain in Seoul to continue to get established as a rider. Sending them overseas is in line with the KRA’s attempts to improve the quality of local jockeys. The academy plays a central role in this but spending time in other, more developed racing environments, is seen as key. Next on the hit-list are the trainers with KRA actively seeking opportunities for trainers to go overseas to study. Shortly after qualifying, Kim Hyo Seob spent time in the United States and a number of trainers are hoping to go to the UK and Australia within the next year.